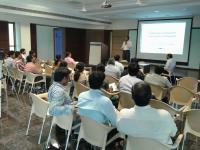 Workshop on "Floss for Research and Innovation" for Academicians and Research Scholars on 6th & 7th Sep 2014. In the present technological era there is an increased penetration of the computing tools and techniques into modern science and technology, education. The technological research is facing challenges of not just teaching the conceptual models of Science & Technology but also equip, train and enable students, researchers and industrial work force to handle these in the furtherance of their goals and objectives. An important challenge to this happens to be the ready availability of such tools, ability to study and modify them suitably to the evolving scientific and technological tempers at both individual and institutional levels. Fostering this scientific and research temper, enabling and empowering the individuals, Swecha in association with FSMI organized its First National Convention for Academics and Research (NCAR-2010). In its succession on the eve of teachers’ day celebrations, Swecha is organizing the a two-day workshop on Research and Innovation. This workshop provides a platform for collaboration and sharing the ideas of innovation and various approaches for FLOSS based research. The present situation of digital barriers like infrastructure, computing restrictions, and preparing ourselves for future tasks will be the main goal. Swecha conducted a two day convention on Network communications at Venkateswara vignana mandiram, Guntur on 7th and 8th August. In this event Y Kiran chandra, General secretary, Free software movement of India gave guest lecture on employment generation. There were huge participation of 700+ students from 30 different colleges of Andhra pradesh. Free Software Movement of India has demanded that the Central and State governments bring in policy changes on Information Technology to give fillip to hardware manufacturing, setting up of data centres and software design centres. This, it said, is possible by establishing Information Technology Investment Regions (ITIR). “The governments need to wake up to the reality of version 2.0 in the IT sector. Leading countries are moving away from version 1.0 - outsourcing of IT enabled services - and are creating new business models centred on automation of IT. The US recently came out with ‘reshoring initiative’, a job resource programme aimed at employing highly skilled software professionals from that country. 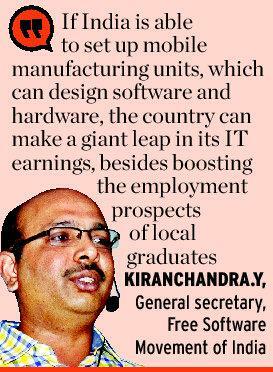 India also needs to wake up and evolve its own business model to tap into the huge market in mobile manufacturing and website hosting,” Kiranchandra.Y, general secretary, Free Software Movement of India, said here on Friday. He was speaking on the sidelines of a student convention hosted by Swecha, Guntur. Mr. Kiranchandra quoted data from the mobile telephony market to augment his demand. “The annual market for mobile telephones in the country is about Rs. 16,000 crore, yet India is yet to have its own mobile manufacturing unit. The mobile handsets designed in China, South Korea and Finland are simply being relabelled and sold in the country,” he said.